Roland SH-201 versus SH-01 Gaia. I own both of these synthesizers and here’s what I think. First, I bought the Roland SH-201 used for $500 bucks over a year ago, so I definitely got it much cheaper than paying full price for the Roland SH-01 Gaia. Personally, for what you get, I think the price should have been the other way around to a certain degree. For my purposes, I actually prefer the Roland SH-201 over the SH-01. Here are my reasons. 1. The Roland SH-201 has software that fully supports the creation and catalog of sounds on the computer. The software is really good. 2. Via the software, you can split the keyboard any way you like. This makes it great to play a bass sound on the lower part of the synth, while cranking out a lead solo on top. 3. If you plug in an iPod with backtracks, you can more easily create a sort of one man band using the Sh-201 since you can split the keyboard better. 4. You also can save your own created arpeggios to the user slots on the SH-201. This is what the SH-01 should have had and I’m mystified as to why they dropped it. User arps is a must for me. 5. You get an extra octave over the 37 keys on the GAIA. Yes, it’s longer but the synth is really not that much bigger and the SH-201 is still light weight. 6. If you only use two layers of sounds ( which most people will I’m guessing initially ), then the SH-201 will get you close to the great sound of the Gaia. Sonically, the Gaia is better, but not by a wide margin in my opinion. I also think the SH-201 is a bit grittier which I personally like for Rock oriented synth stuff I sometimes like to play. Some think basses are slightly better sounding on the SH-201 as well, but that is subjective I know. 7. You still get the D-Beam, Ext In, Phrase Recorder, and all the other bells and whistles that the Gaia has with the exception of the effects. Most will probably just plug in an external effects processor to compensate. 8. The Roland SH-201 can be found at blow-out prices if you act quickly. Later on, the demand might hike it up once people realize that “perhaps” it is a nice synthesizer after all. While I slightly prefer and recommend the SH-201 over the SH-01, the GAIA does have some notable pluses. The sound is better by most accounts, you get the three tone layers and effects palette, plus it definitely is more portable if you need to hike around with it. It’s also arguably better looking. You also get the USB stick connection and it’s new, so support may blossom, although Roland so far has been very weak and slow with marketing this product. 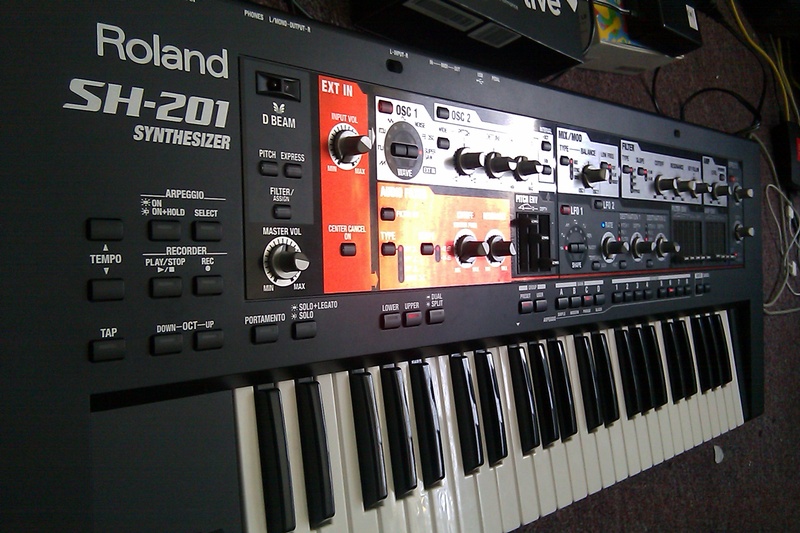 All in all, if I could only choose one synth to buy, it would be the Roland SH-201. There’s just more functionality to it and sonically, not that much off the Gaia so far. Perhaps my view may change later on. Stay tuned.. Thanks A LOT for this fair review as I am planning to purchase one of them to start playing electro’ music. Although I am not a specialist, I also reached the same conclusion looking at each one’s features and reading through the forums. Hello Francois! Thanks for checking out my blog post. Since writing this review I have learned that the Roland SH-201 and SH-01 Gaia have completely different synth engines. This apparently explains why the SH-201 sounds a bit more raw and is more popular with harder edge electro music. This is all subjective of course, but I’ve read a few articles from other SH-201 users how they like the grittier sound for the 201. I tend to agree. Also, I found out that indeed there are a couple of Chorus effects under the Flanger effect settings for the Roland Gaia SH-01. I checked and it sounds very good for those wondering about the Chorus on the Gaia. With the Roland SH-201 you’ll have to use external effects, but if you’re already a guitar player like myself, one should have a Chorus pedal lying around somewhere. You actually have chorus in SH-201. thanks for this somewhat objective review. i got the sh-01 in exchange for a smartphone (?!!). the guy who traded the sh was not into synthesis modeling and was a bit disappointed that the 201 lack the usual preset tones he was looking for such as piano, strings, etc., for his show band. so the synth was hidden in its box for about a year or two until he recently advertised it on a local version of ‘ebay’. it was practically brand new, no dents or dings or anything. i think your no. 8 post hit the nail. a lot has been said about this roland – both good and many bad. nonetheless, this synth is a blast! i also think i’m really one of the target market of this device and certainly not novices nor those snooty synth ‘connoisseurs’ that you find many online – putting their half-baked opinions after just testing the synth at a store for less than ten minutes. i’m a sound artist doing sound scapes and all, so the sh-201 is perfect. SH-01 actually has an editor/librarian software, but I guess it should be bought separately. Indeed Roland has released an editor for the GAIA SH-01 since I last wrote this post. Thanks for the update. Unfortuntaely, it still puts the Roland SH-201 slightly ahead in my book on the editor front. Roland’s new SH-10 GAIA software will cost $99 while the Roland Sh-201 software is free. Furthermore, the Roland SH-201 software adds functionality like split keyboard and an arpeggio editor, while the Roland GAIA SH-01 appears to do nothing more than what one can already do hands on with the synth. No complaints in that Roland nicely released an editor for the GAIA, but compared to the SH-201 editor, I think the SH-201 still wins, although slightly. It’s rather disappointing that Roland slapped a $99 price on the SH-01 GAIA software though. I guess it’s all about money in this shrinking economy these days. Really a pain point with the SH01. I love mine but I’m a little pissed they sell the SD product separately for $90-100 (which I can’t afford). Will the free 201 software work with the Gaia?? Does anyone know of a good alternative to the SD SH01 software? Love me some Roland but this was a slap in the face! All in all, thank you for your comparison in these two fine synths. I was thinking about getting one, mainly for industrial/metal type of music. Unfortunately, it seems that local Roland dealer in my country did not import any SH-201’s, so I will have to search hard and wide to find a specimen to try it out. Hello Rade! Thanks for the comments. I think if I walked into the store and saw both the SH-201 and SH-01 sitting together, I’d probably walk out with the Roland SH-201 only because I tend to buy functionality over sound. I like to program my own stuff so presets aren’t critical plus I “unusually” don’t nitpick on sound that much with regards to analog versus digital. I suppose I like the challenge of making something sound good through programming and nice playing. With that said, if I only saw “ONE” the Roland SH-01 Gaia in the store OR the SH-201, I’d buy either one. They are both really nice and above all fun to play. I hope you can find one of them in the near future in your country as I’m sure you’ll have a blast performing on either synth. Good Luck and thanks for stopping by! Much appreciated. 1- I’m a huge fan of ” Jean Michelle Jarre ” ; I also like the style of old Pink Floyd’s records . so which one of them would be better for me : SH-201 or GAIA SH-01 ? 2- I’m a guitar player and I use ” Marshall Class 5 ” for home play & practice . now I need a same amp for my home synth ( 201 or GAIA ) . I mean a low wattage amp for home use , with a warm tone and super natural sound . Roland suggests ” KC60 ” amp , but it’s a 40w amp and I really don’t need it ! do you know any synth amp , as well as ” Marshall class 5 ” ? Hi everyone! I’m looking for anyone willing to sell their Sweetwater Gaia bonus patches to me privately. Unfortunately, being here in Japan, it’s not practical to buy my gear overseas from Sweetwater or any other company for that matter. Thus, I’m looking for someone who’s interested in making some extra bucks for the Holidays. Did anyone buy their Roland SH-01 Gaia from Sweetwater? I’m more than happy to pay a fair amount for these. Please send me an email and we can discuss. Thanks!!! Here’s a demo of the Sweetwater Gaia bonus patches. They sound very good. 1. Only 1 sound and no split (SH-201 has two). The polyphony quoted is a waste of time. 2. Max 3 Oscs running at one time for big layered sound. (SH-201 has 4 in layer mode). that means its even fatter than the GAIA! 3. Buying the editor ….. no way.. big mistake Roland. 4. Silly little keys and only 3 Octs (The SH-201 has four Octs and is normal width but reduced depthed which is a pleasure to play). The only thing i would change in my SH-201 is having tempo synced delay. but i usuall let teh DAW do that anyway. I will never sell my SH-201 ever. It has a great sound in the mix. it cuts thru when you need it. the grittyness is actually better when mixed. May i give you SH-201 owners a little and you will love me for this…..
ASIO4ALL as your main audio driver. That way you can use the SH-201 USB and send the DAWs output to its filters!!!!!!!!!! oK theres a bigger latency but not too bad with a decent set up. Pugface, you obviously didn’t look at the Gaia very closely. It has normal size keys, not “silly little keys”. Check it out! FREE GAIA SH-01 Patch Collection Promo. In order to receive an email containing the link to the new GAIA Fisher Patch Collection, please complete the questionnaire below. http://www.rolandus.com/go/gaia_promo/ . What do you think of the new Patch Collection? Update: My first attempt at the survey resulted in my web browser “Firefox” not submitting the data correctly. It could have been a problem with the Roland website too. I switched to another computer and used Explorer. I was then able to complete the survey and download the GAIA_Fisher_Collection.zip file for the Roland SH-01 Patch Collection. Ok, I am on the fence about SH-01 or the SH-201. I can get a used 201 for 400$ or a new Gaia SH-01 for 650$. I cant decide. Am I getting what for 250$ more on the SH-01? Is it Sonically that much better? I have played a SH-01 at store but never played a SH-201.Is the 201 “Old Tech” or does that even matter? Does the SH-01 being “New Tech” have an advantage. Is the SH-01 “Easier” to learn or same? Personally, I would have more fun with the Roland SH-201 and putting the saved $250 into something like a drum machine, sampler, or other synth that can layer. I don’t think you get that much more at all paying $250 extra for the Roland GAIA. In addition. it’s likely the price of the GAIA will eventually fall in the future. Both synths sound great. The SH-201 has a few more functions like splits, but the GAIA does have the layers. The software for the SH-201 is also more refined and tested with more features. I’ve always maintained and still do even now that I would buy the Roland SH-201 first and then later the GAIA SH-01. That’s what I did and haven’t regretted it. I still play the SH-201 more than the Gaia simply because I find the SH-201 slightly more versatile. Thnx for the great blog and the insightfull posts and replies. One question how is the software support for windows 7 64 bit with the sh 201? Well I got the SH 201. And all your points above 1-8 are reason enough. I do like the grittier sound. The splitting of keyboard and extra octave. The price, I got it for 374.95 used in mint shape! The Free Software. And one of the biggest is the ability to save user created Arps. Thanks for your review Jim I was able to make the right decision. Thanks a lot! I had an SH-201 but sold it for financial reasons. Thought of re-buying it, but paused a little thinking that the GAIA might be a better choice… well in a way I am happy to find out that the SH-201 is somewhat “better” I really liked it and I am very happy to buy it again. Plus it’s only 350 bucks used now! First of all, I really enjoy reading your blog. Always very interesting and insightful information which is a real pleasure to read. I have been keeping my eye on a SH-201 for a controller keyboard for my DAW, as I thought it would be really useful for that, along with getting a great synth too! I just wondered when you play the oscillator waveforms mixed together whether they are of the “free-running” type or whether their phase is initialised on each note played? Many thanks. This is an old topic but I just bought a s/h SH-201 wich I think just sounds great! I have now investigated a bit more now and it seems like there are two different programs- the editor wich loads sounds one by one in .she format, and the librarian wich loads whole soundbanks in .shl format, roland websupport only have the editor for download and no sign of the librarian wich I need, It was propably on the CDrom wich I guess came wit the SH-101 when you bought it new.. Dou you have it? Problems solved thanks to Roland support! Thanks anyway for great synt-blog and good luck with your synths Jim! I just snagged a mint Roland SH-201 for $200 at the pawn shop and so far I’m loving it. Synced it to my TR8 drum machine + TB3 and using it to drive appregios on my Korg Prophecy. It’s gritty, fun to tweak and sounds fantastic. So easy to program. Massive sounds with the layered super saws split layered. Hi, thanks for the comparison between the SH-201, and the SH-01. I admit, I slept on these units when they hit the market. I was at my local pawn store, and they had the SH-01 for a incredible deal. I am rather poor, so I just had to do it on layaway. With that being said, the software editor has been discontinued! That’s a shame, but if I could find the software, I’d make sure to get it to max out the potential of the Gaia. As far as the SH-201, being the better synth, I would just have to look into that one much later. But thanks for the information. Let me know if you can track down the 01 editor. Thanks! I have this question I can’t find answer : On the SH-201 it was possible to plug an mp3 player through external input and then apply the cut off and resonance filter on the played track. Has the GAIA the same possibilities? I challenge anyone to find so many cool feature and such great sounds in a keyboard at that price range. I use it in sync with a Korg ER 1 and EA 1 and it works perfectly. I know it’s all digital but still good enough for my ears.